With only a couple of weekends remaining of the school holidays, I asked Becky yesterday evening what she would like to do today. 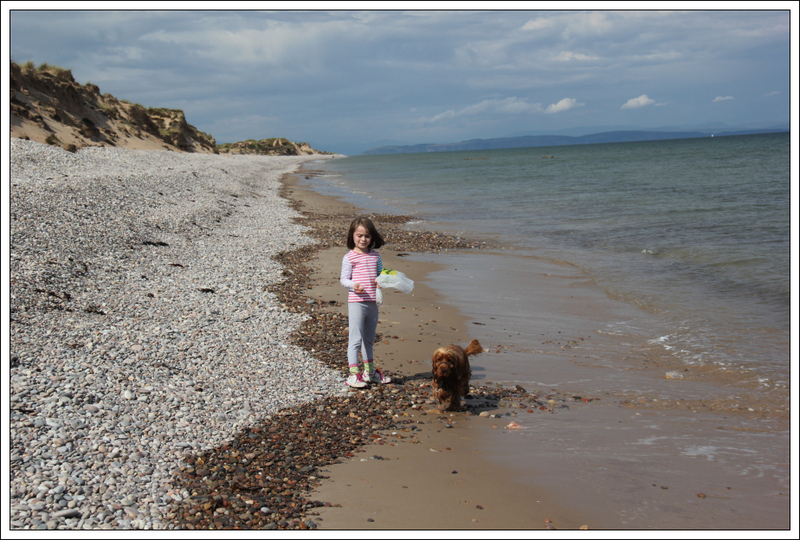 She opted for a walk along a beach rather than a hill ascent or a visit to Aberdeen or Inverness. 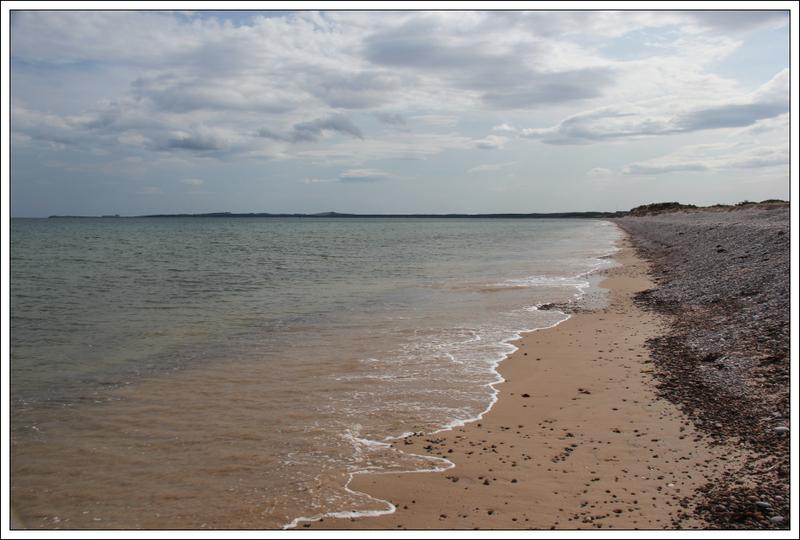 I therefore worked out the logistics for undertaking a walk from Burghead to Findhorn (or vice-versa). 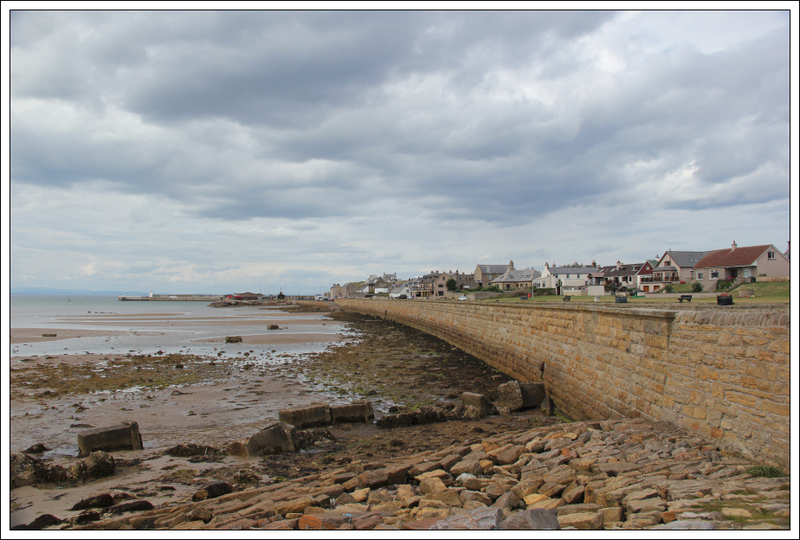 With the bus routes and times established, this morning we drove to Burghead. 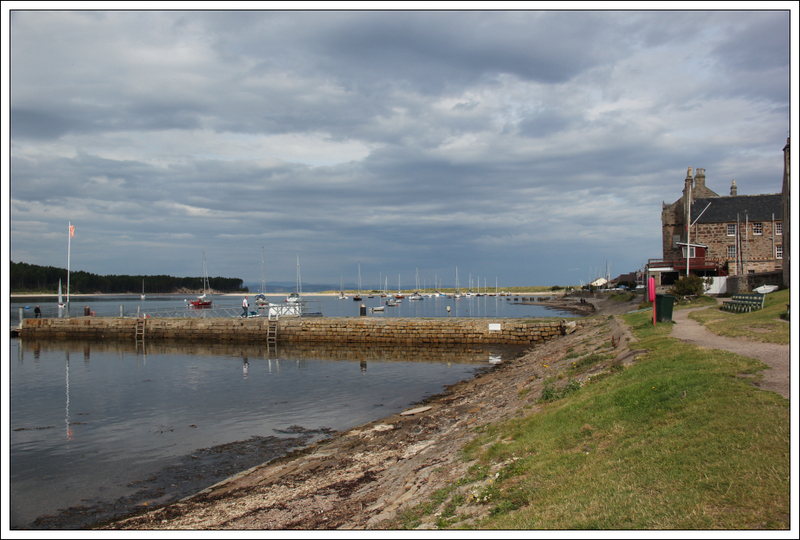 I parked a short distance along from the harbour where there are numerous parking spaces. We then walked up the main street to catch the No 32 bus to Elgin Bus Station and then the No 31 bus from Elgin Bus Station to Findhorn. This allowed us to undertake a traverse finishing back at the car. 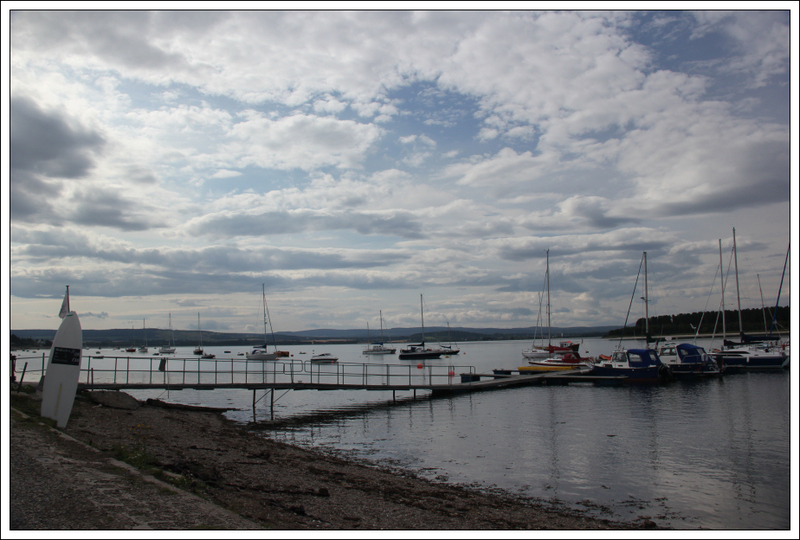 We disembarked from the bus circa 1km outside Findhorn. 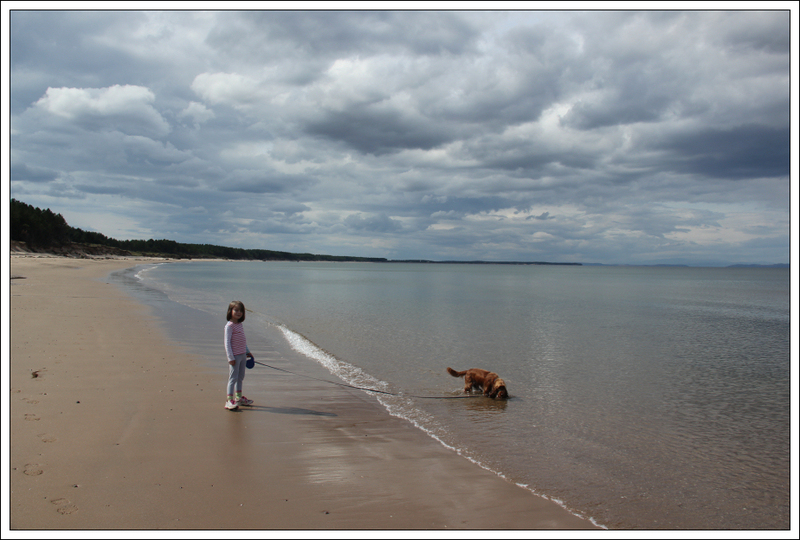 Instead of walking along the pavement to Findhorn we opted to get down onto the shore. 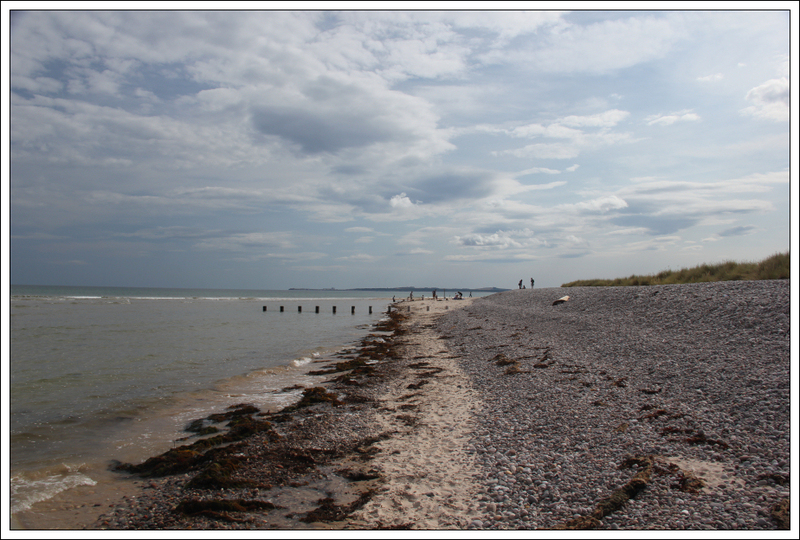 I think my version of the Moray Coastal Trail is far more interesting than the actual Moray Coastal Trail. Get off the track and stick to the shore as much as possible. 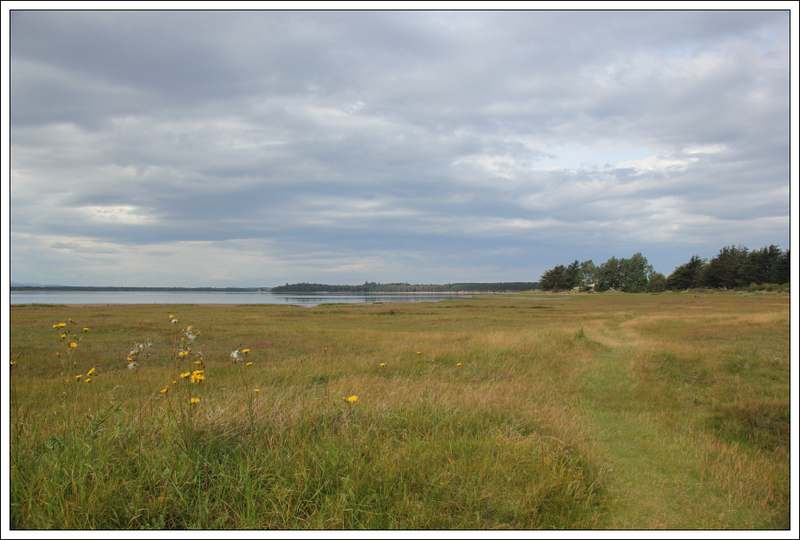 You will get much better views and see much more wildlife. 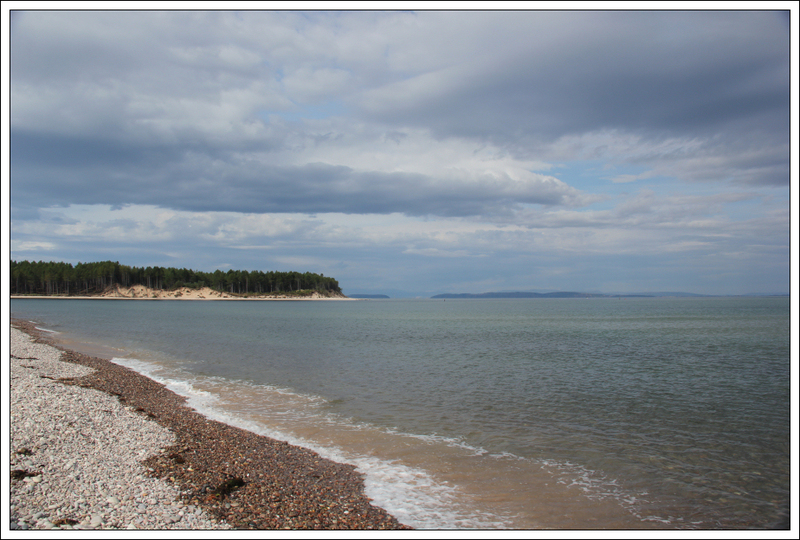 Today was my first ever visit to this area and first visit to Findhorn. I was pleasantly suprised; it is really nice. 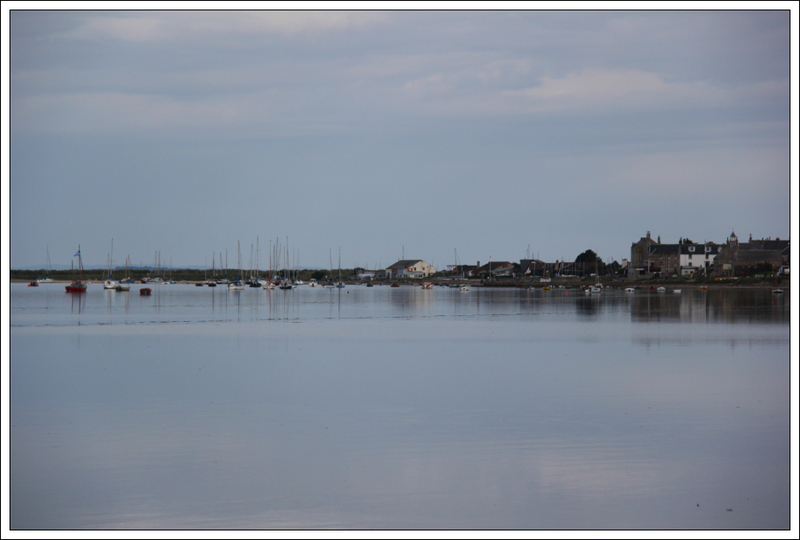 Rather than taking any short-cuts, we fully skirted round the edge of the bay. 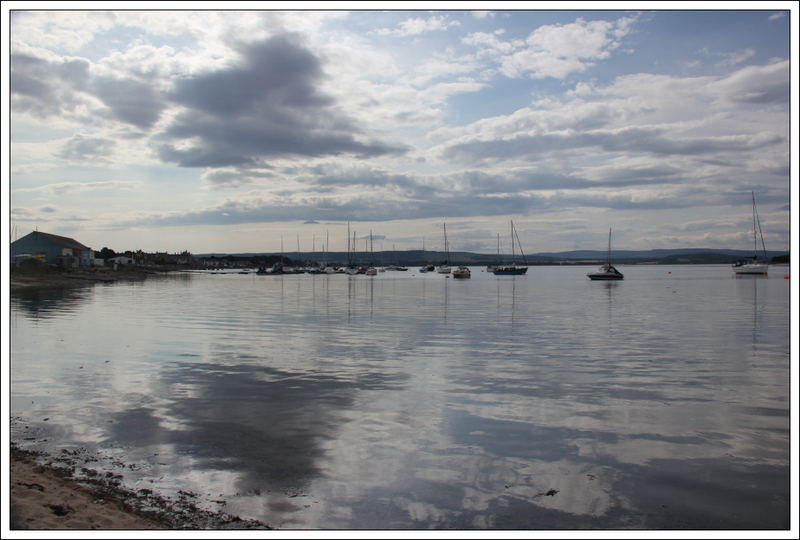 On looking across to Culbin Forest, I started reflecting on the next section of coast i.e. 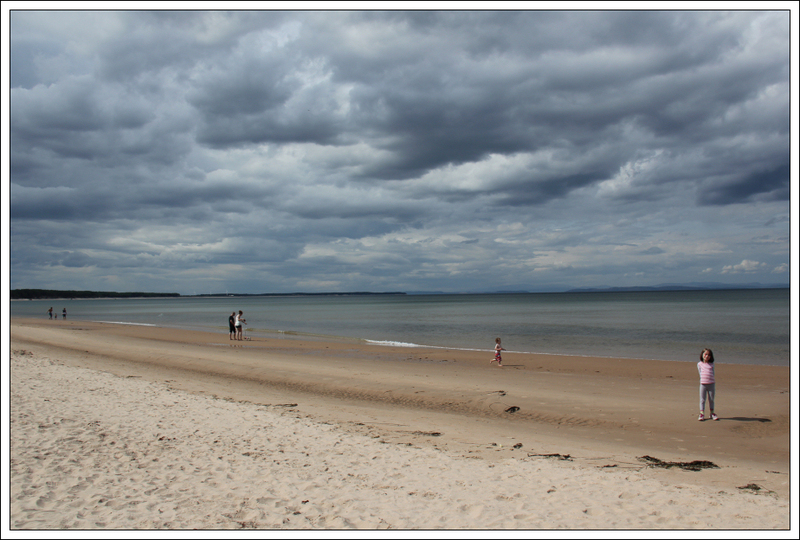 the coast between Findhorn and Nairn. We disappointingly reached the shore at exactly high tide. 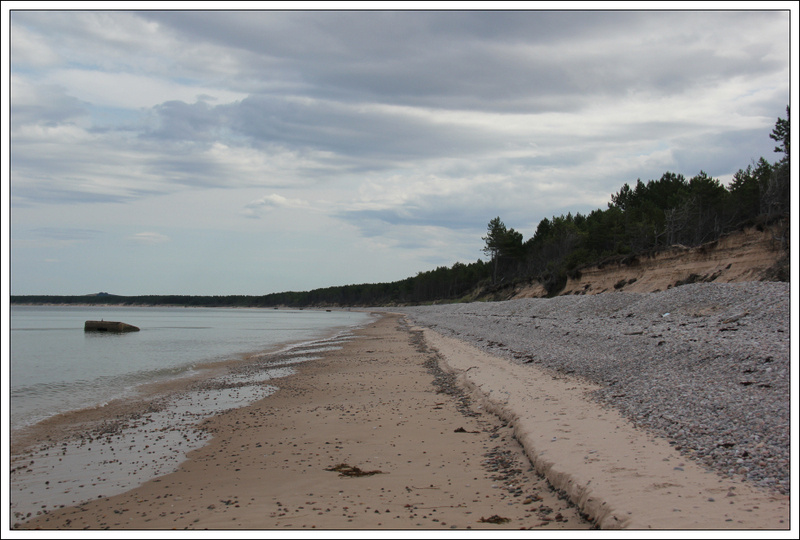 We therefore had to walk on pebbles instead of long stretches of beautiful sand. 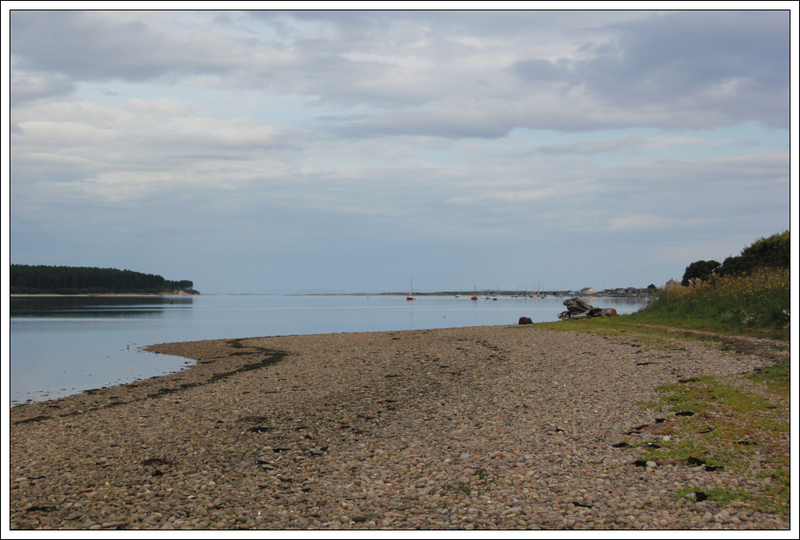 However, I enjoyed this stretch of coast so much, I may come back to do it again at low tide. 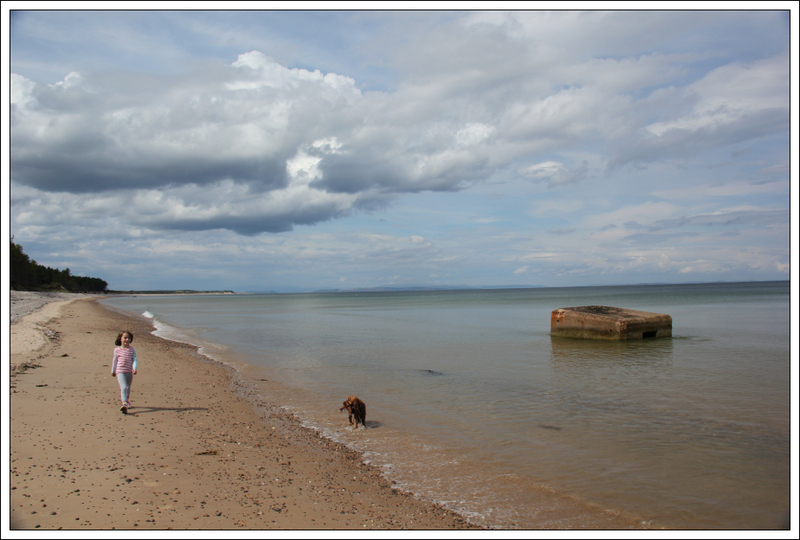 As per many other stretches of Moray Coast, there are numerous anti-tank blocks and lookout shelters from WWII. 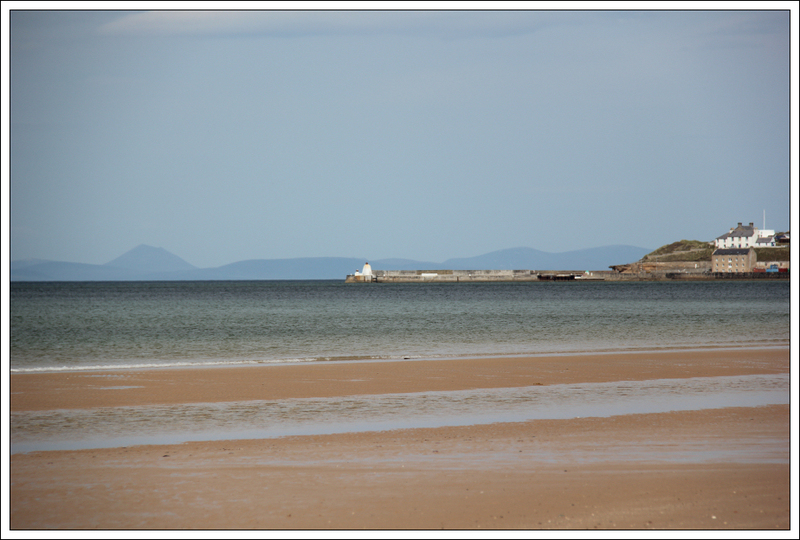 As the tide started to go out, we were able to walk a narrow stretch of wet sand which was much nicer than walking on pebbles. During the walk along the beach, I gave Becky a bag to collect some shells. 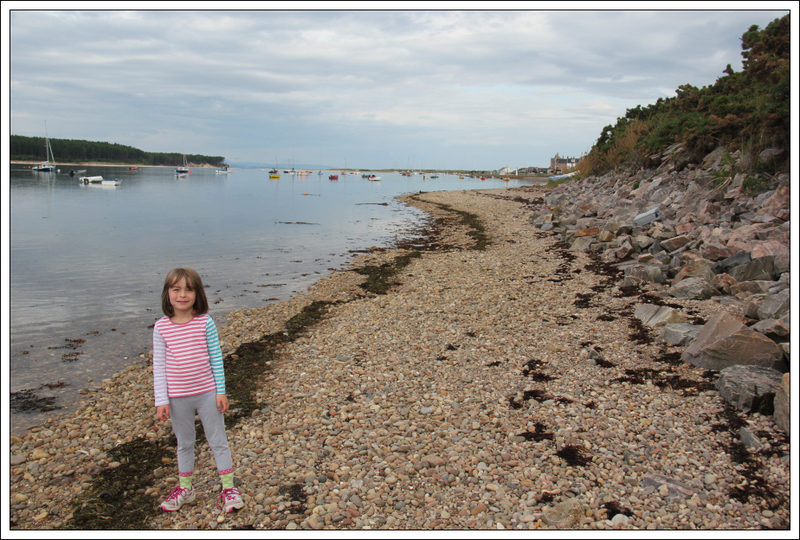 However, instead of collecting shells she decided to collect a variety of nice pebbles. I decided to try letting Cuillin off the lead for the first time in an open area. 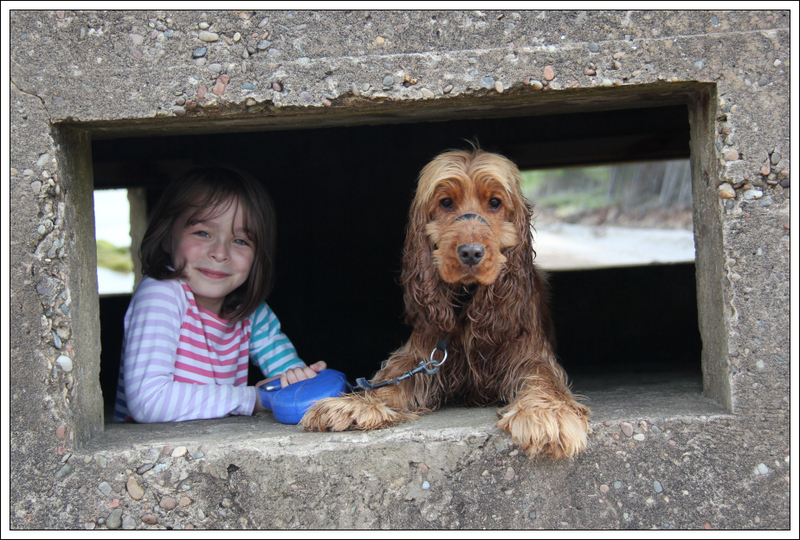 For circa 20 minutes he was very well behaved, never venturing more than five metres away. That is until he spotted a crow. He took off after the crow and was completely deaf to all calls. 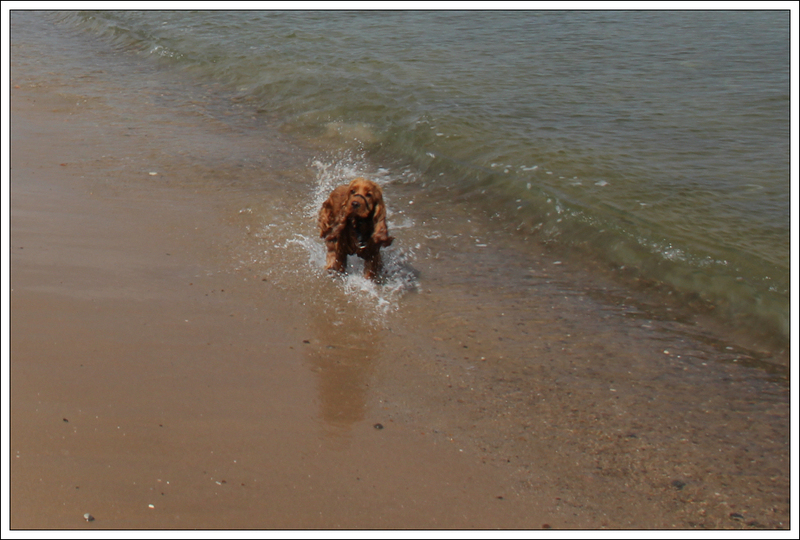 After chasing it for circa 400 metres along the beach, he turned round and ran back to us. Mischievous mutt! 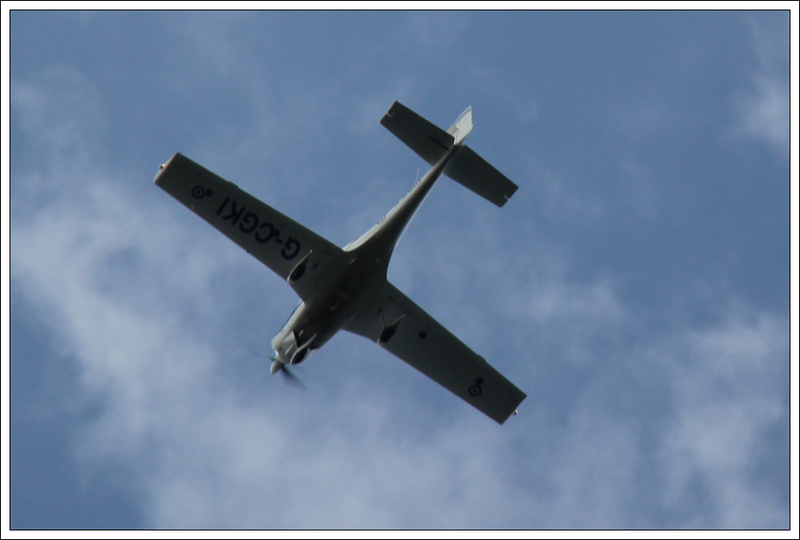 As we walked along, we saw a small plane doing numerous circuits above us. 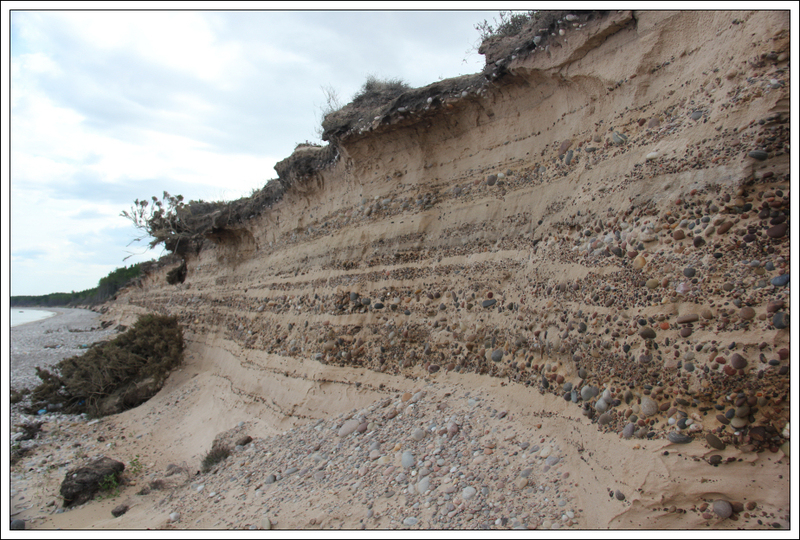 There are fairly high sand dunes along the coast some of which are quite eroded. It was nice to see several layers of pebbles in the dunes. 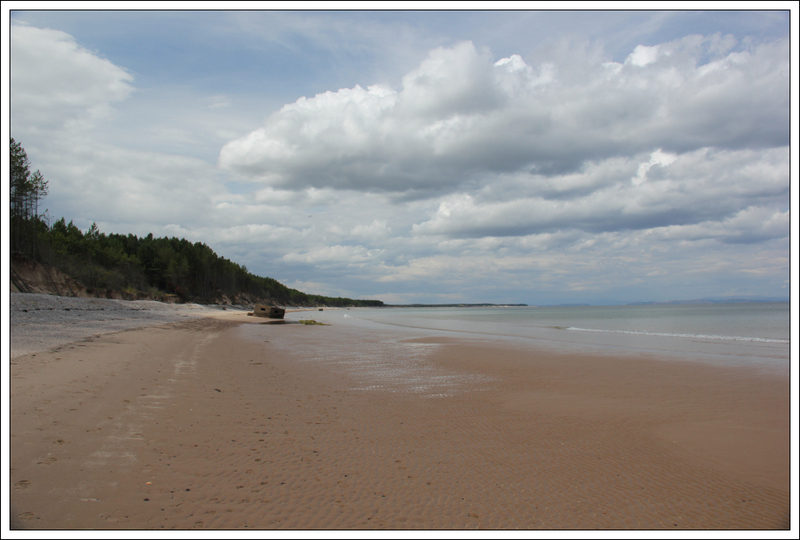 On reaching the forest, I knew we were circa half-way round Burghead Bay. 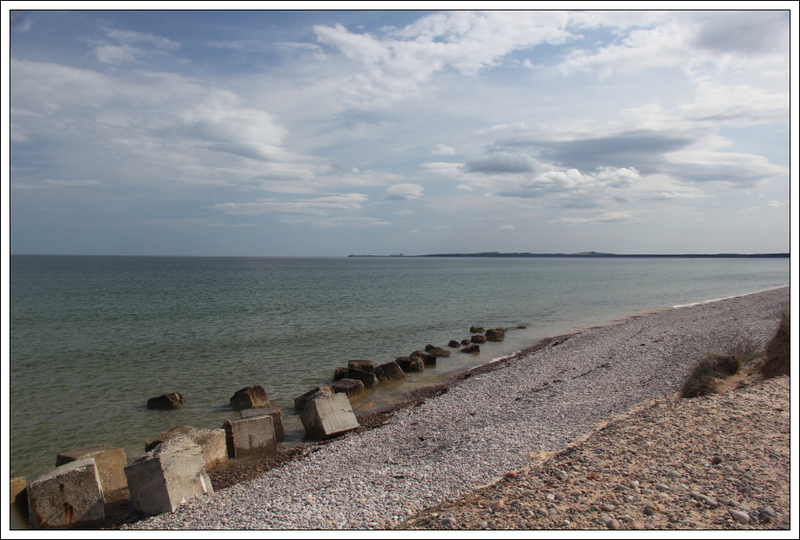 Out in the sea, I could see a large number of merganser. 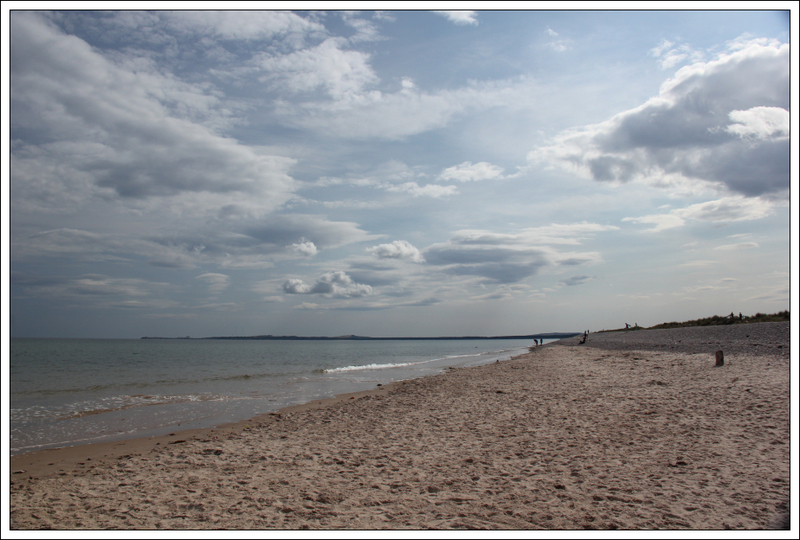 It was nice to get more and more beach as the tide went out. 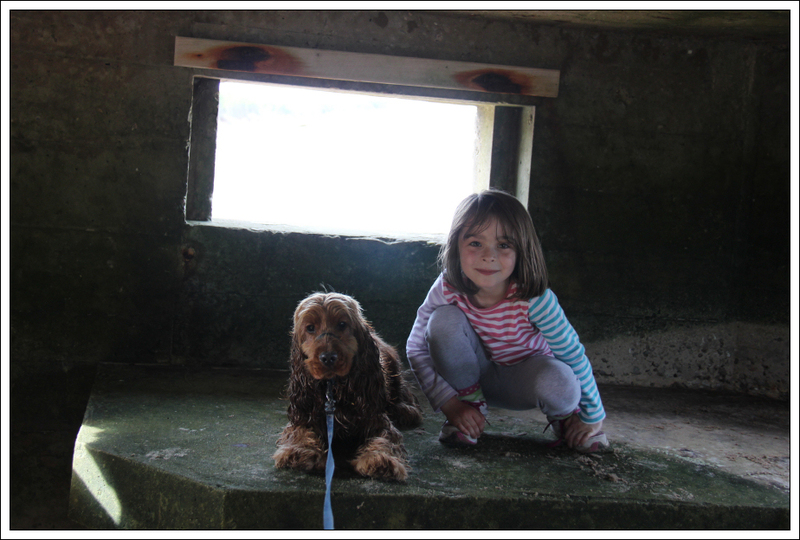 On reaching the first lookout shelter that wasn't submerged with water we had a look inside. 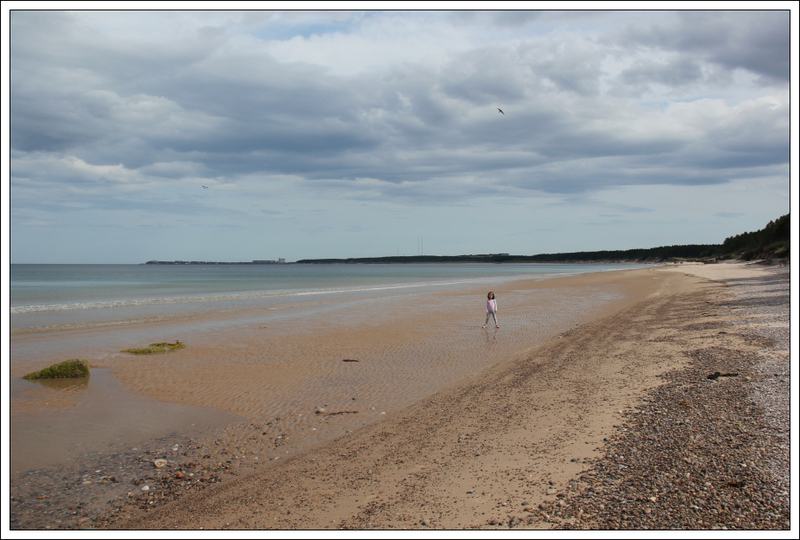 Circa 2km from Burghead, we came to a stretch of beach occupied by a number of people. I assume there must be a road/track leading to this section of beach. 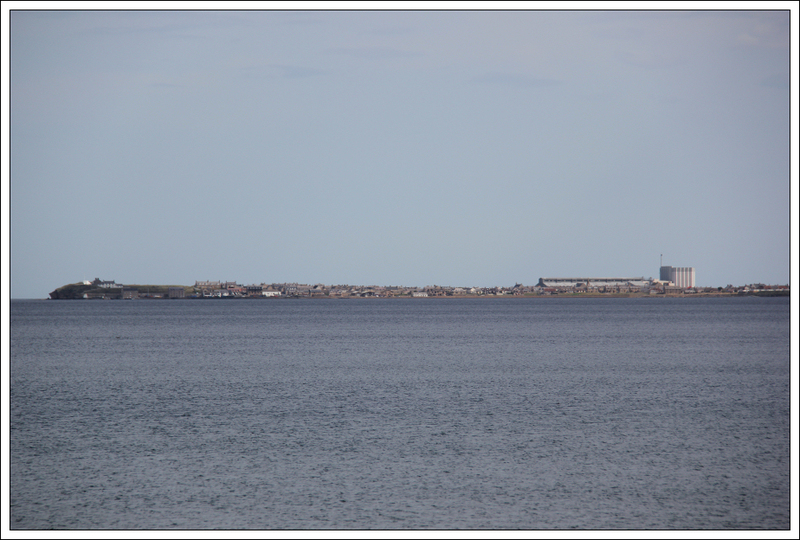 On approaching Burghead, I stopped to take a photo of Morven in Caithness. It is a cracking hill. 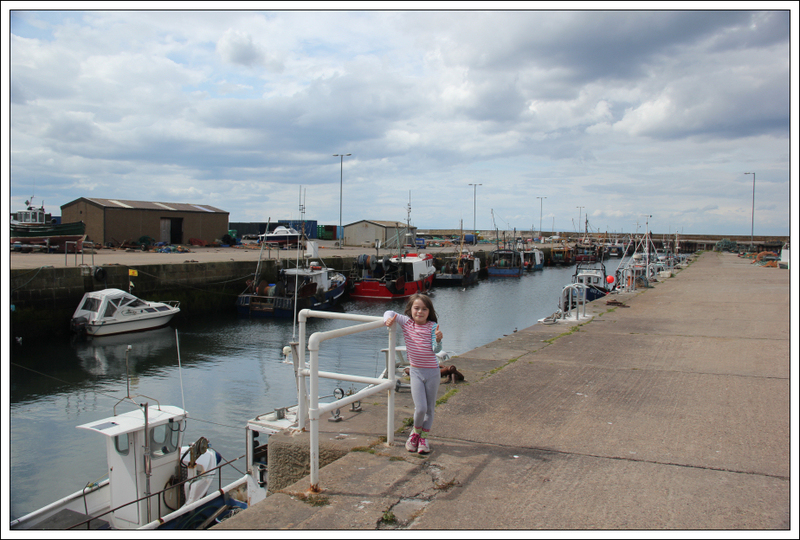 We finished our walk at the harbour in Burghead. 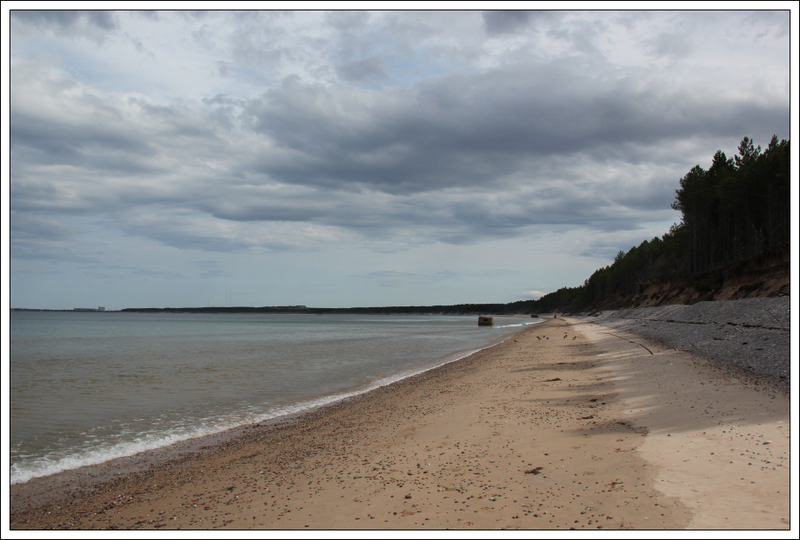 We had walked all 14.5km along sand and pebbles. The last time I was in Burghead was just after New Year when I attended the Burning of the Clavie. This spectacle is well worth attending. 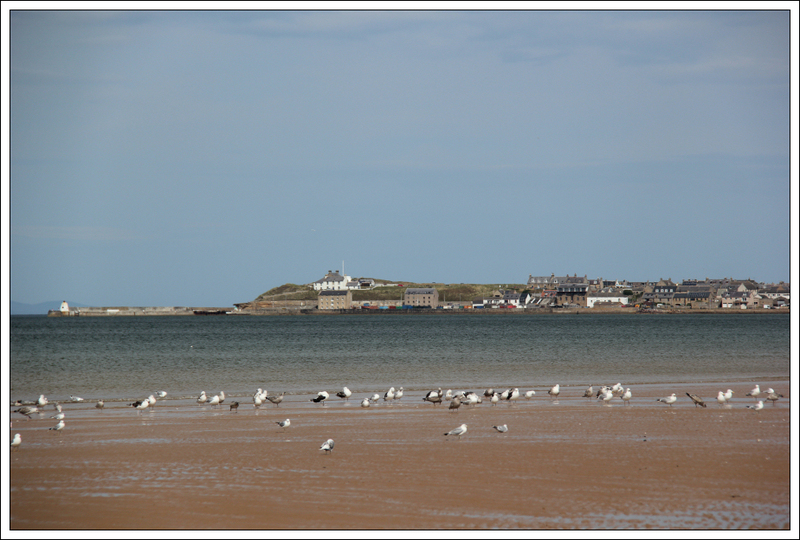 It was nice to revisit Burghead but disappointing not to bump into my friend who lives there. Hopefully next time.